The third coronal mass ejection in two days erupted off the sun in the direction of Mercury on April 21, 2013, at 12:39 p.m. EDT (1639 GMT). This image of the CME, shown shooting off the right side of the image, was capture by the joint ESA and NASA Solar Heliospheric Observatory (SOHO). The sun is blocked in this image so its brightness doesn’t obscure the solar atmosphere, the corona. The sun has unleashed a trio of solar eruptions toward the planet Mercury in recent days, solar storms that may pass one NASA spacecraft while dealing a glancing blow to another, NASA officials say. The three flares erupted from the sun over the span of two days, and belched waves of plasma and charged particles — called coronal mass ejections (CMEs) — that are now heading toward Mercury, NASA officials said in a statement. 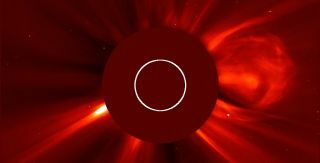 The combined CMEs are expected to pass the agency's Messenger probe, which has been orbiting the planet closest to the sun since March 2011, but may deliver a glancing blow to the Stereo-A spacecraft, which circles Earth while training its eyes on the sun. This image of a coronal mass ejection (CME) was captured on April 20, 2013. The CME is headed in the direction of Mercury. The large bright spot on the left is Venus. The first CME erupted at 2:54 a.m. EDT (0655 GMT) on April 20. Two additional CMEs followed the next day, at 3:54 a.m. EDT (0754 GMT) and 12:39 p.m. EDT (1639 GMT). All three clouds of superhot plasma were blasted from the sun at speeds greater than 1.8 million miles per hour (2.9 million kilometers per hour). When aimed directly at Earth, the strongest solar flares and eruptions can pose a threat to satellites and astronauts in space, and interfere with navigation, communication and power infrastructure on the surface. NASA's Stereo-A is one of a pair of twin space probes that monitor solar weather events. The Stereo spacecraft (short for Solar Terrestrial Relations Observatory) were launched in 2006. The Messenger spacecraft completed the first full map of Mercury's surface last month. The probe's primary mission ran through March 2012, but was granted a one-year extension. The sun's activity ebbs and flows on an 11-year cycle, and solar weather events are expected to increase this year as the current cycle ramps up toward the solar maximum. The current solar weather cycle is known as Solar Cycle 24.